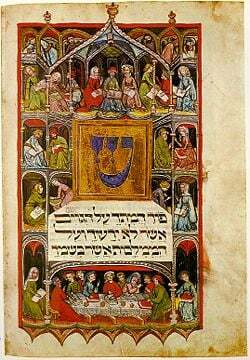 A 14th century German illuminated Haggadah for Passover. The text on this page begins Psalm 79 verse 6. Haggadah (meaning "tales," "lore"; pl. Haggadot ) refers to non-legally binding texts in classical rabbinic literature, which are primarily of an exegetic and homiletic nature. Other terms for this body of teachings are Aggadata (אגדתא) lit.“the” aggada, and Aggadah (הגדה; pl. Aggadot). In general, the Haggadot are presented as folklore, historical anecdotes, moral exhortations, and advice. Sometimes they refer to mythical creatures, and incredible historical events. Some Rabbis have suggested that Haggadah may contain two types of meaning as recorded in the Talmud and Midrash: literal and allegorical. It is said that only those with the proper spiritual "keys" can unlock the higher allegorical meaning of the Haggadah (see below). The Haggadah is part of Judaism's Oral law (תורה שבעל פה)—the traditions providing the authoritative interpretation of the Written Law. In this context, the widely held view in Rabbinic literature, is that the Haggadah is in fact a medium for the transmission of important teachings (Homiletic Sayings - מאמרים לימודיים) or for explanations of verses in the Tanakh (Exegetic Sayings - מאמרים ביאוריים). Much of the Haggadah is understood as containing a hidden, allegorical dimension, in addition to its overt, literal sense. In general, where a literal interpretation contradicts rationality, the Rabbis seek an allegorical explanation and are told to use commonsense to decide whether an aggada is to be taken literally or not. Moshe Chaim Luzzatto discusses this two-tiered, literal-allegorical mode of transmission of the Haggadah in his well known Discourse on the Haggadot. He explains that the Oral Law, in fact, comprises two components: the legal component (חלק המצוות), which discusses the mitzvot and halakha; and "the secret" component (חלק הסודות), which discusses the deeper teachings. The Haggadah, along with the Kabbalah, falls under the latter. The Rabbis of the Mishnaic era, realized the danger of recording the deeper teachings in explicit, mishnah-like, medium. Rather, they would be conveyed in a "concealed mode" and via "paradoxes." It was thought that due to their value, these teachings should not become accessible to those "of bad character" and due to their depth they should not be made available to those "not schooled in the ways of analysis." This mode of the transmission was nevertheless based on consistent rules and principles such that those "equipped with the keys" would be able to unlock their meaning; to others they would appear as non-rational or fantastic. In line with the above, Shmuel ha-Nagid, in his "Introduction to the Talmud," states that "Aggadah comprises any comment occurring in the Talmud on any topic which is not a commandment (i.e. which is not halachic) and one should derive from it only that which is reasonable." As regards this, Maimonides, in his preface to the tenth chapter of Mishnah Sanhedrin ("Perek Chelek"), describes three possible approaches to the interpretation of the Haggadah. The first approach is to accept the Haggadah as literally true, without admission of any hidden, allegorical explanation—even where a literal interpretation runs counter to common sense. Maimonides is dismissive of this approach. The third approach is to recognise that many Haggadot are intended to teach profound truths, and that the teachings thus operate on two levels: "overt" and "hidden." Thus, any impossible assertion was, in fact, intended as a parable; further, where Haggadot can be understood literally, they may be taken on this level. This is, in general, the view of the Rabbis. “It is proper… to carefully analyse [the Haggadot]… when any of these seem far-fetched we must immerse ourselves in the various branches of knowledge until we understand the concepts.” (Maimonides, op cit). The Haggadah is today recorded in the Talmud and the Midrash. Throughout the Talmud, Haggadic and halakhic material are interwoven—legal material comprises around 90 percent. (Tractate Avoth, which has no Gemara, deals exclusively with non-halakhic material, though it is not regarded as aggadic in that it is focused, largely, on character development.) The Talmudic Haggada, generally, convey the "deeper teachings"—though in concealed mode, as discussed. The Ein Yaakov is a compilation of the Haggadic material in the Babylonian Talmud together with commentaries. Chiddushei Aggadot (Novellae on the Aggadot) by Samuel Edels "the Maharsha"
Yehoyada and MeKabtziel (names based on 2 Samuel by Yosef Chaim "the Ben Ish Chai"
Beur Aggadot (Clarification of the Aggadot) and Perush al Kamma Aggadot (Commentary on several Aggadot) by Elijah ben Solomon "the Vilna Gaon"
In the Midrash, the Haggadic and halakhic material are compiled as two distinct collections: the Haggadic Midrashim, generally, are explanatory aggada, deriving the "sermonic implications" from the biblical text; the Halakhic Midrashim derive the laws from the text. Note that many of the Torah commentaries, and the Targumim, interpret the Torah text in the light of Aggadic statements, particularly those in the Midrash, and hence contain much material on Haggadah interpretation. The Haggadah has been preserved in a series of different works, which, like all works of traditional literature, have come to their present form through compilation and revisions. Their original forms existed long before they were reduced to writing. The first traces of the midrashic exegesis are found in the Bible itself. In the time of the Soferim, the development of the Midrash Haggadah received a mighty impetus, and the foundations were laid for public services which were soon to offer the chief medium for the cultivation of Bible exegesis. Much Haggadah, often mixed with foreign elements, is found in the Apocrypha, the Pseudepigrapha, the works of Josephus and Philo, and the remaining Judæo-Hellenistic literature; but Haggadic exegesis reached its height in the great epoch of the Mishnaic-Talmudic period, between 100 and 550 C.E.. The Haggadah of the Amoraim (sages of the Talmud) is the continuation of that of the Tannaim (sages of the Mishna). The final edition of the Mishnah, which was of such signal importance for the Halakah, is of less significance for the Haggadah, which, in form as well as in content, shows the same characteristics in both periods. It is important to emphasize the difference between exegetical and homiletic Haggadot. When the Rabbis undertook to edit, revise, and collect the immense array of Haggadot, they followed the method employed in the halakic discussions. They arranged in textual sequence the exegetical interpretations of the Biblical text as taught in the Rabbinical schools. The work of the editor was often merely that of compilation, and the midrashim are in the nature of running haggadic commentaries to single books of the Hebrew Bible. The Ein Yaakov is a compilation of the Haggadic material in the Babylonian Talmud together with commentary. Sefer Ha-Aggadah (The Book of Legends) is a classic compilation of Haggadah from the Mishnah, the two Talmuds and the Midrash literature. It was edited by Hayim Nahman Bialik and Yehoshua Hana Ravnitzky. Bialik and Ravnitky worked to compile a comprehensive and representative overview of Haggadah; they spent three years compiling their work. When they found the same Haggadah in multiple versions, from multiple sources, they usually selected the later form, the one found in the Babylonian Talmud. However they also presented some Haggadot sequentially, giving the early form from the Jerusalem Talmud, and later versions from the Babylonian Talmud, and from a classic midrash compilation. In each case, every Haggadah is given with its original source. In their original edition, they translated the Aramaic Haggadot into modern Hebrew. Sefer Ha-Aggadah was first published in 1908-1911 in Odessa, Russia, then reprinted numerous times in Israel. In 1992, it was translated into English as The Book of Legends, by William G, Braude. Legends of the Jews, by Rabbi Louis Ginzberg, is an original synthesis of a vast amount of Haggadah from the Mishnah, the two Talmuds and Midrash. Ginzberg had an encyclopedic knowledge of all rabbinic literature, and his masterwork included a massive array of Haggadot. However, he did not create an anthology which showed these Haggadot distinctly. Rather, he paraphrased them and rewrote them into one continuous narrative that covered five volumes, followed by two volumes of footnotes that give specific sources. Mimekor Yisrael, by Micha Yosef (bin Gorion) Berdichevsky. Berdichevsky was interested in compiling the folklore and legends of the Jewish people, from the earliest times up until the dawn of the modern era. His collection included a large array of Haggadot, although they were limited to those he considered within the domain of folklore. The collected works of Dov Noy. According to Peninnah Schram, "Dov Noy is the fourth major figure in the renaissance of preserving and perpetuating the Jewish oral tradition. While he published many books and important essays (including the entry “Folklore” in The Encyclopedia Judaica), his two main contributions were: 1) he applied an international classification system to Jewish traditional narrative; and 2) he established the Israel Folktale Archives...in 1954, Noy established the Israel Folktale Archives and Ethnological Museum at Haifa University. Presently, this archive contains over 23,000 folktales, classified according to tale types and motifs, country of origin, informant, etc. These folktales have been collected from all the various ethnic communities who live in Israel." ↑ 23:20, mechon-mamre.org. Retrieved February 7, 2008.
bin Gorion, Micha Joseph. Mimekor Yisrael: Classical Jewish Folktales Abridged and Annotated Edition. Indiana University Press, 1976. ISBN 0253311586. This page was last modified on 24 July 2017, at 19:29.